Why buy a home from Gainey Custom Homes? Rarely do we get this question asked directly from our customers, but GCH would be naive to think that our customers are not asking this question to themselves or their significant other whenever they are shopping for a new Factory Built Home. Obviously there are other manufactured home brands being sold by other manufactured home retailers, offering similar services, and all things being considered, similar pricing. So the most important question really is, What’s the Difference? What does GCH offer and do differently than their competitors. We want all our customers to feel welcome to freely browse our model homes with no pressure, and feel comfortable to ask any questions or concerns that they may have, and be able to provide them with accurate information and straight talk on pricing. Buying a new home for anyone is HUGE! It is the American Dream. It is most likely the largest single purchase anyone of us will ever make. There are numerous moving parts, from financing, customizing your home order, permitting, land preparation, home installation, and county inspections. Most people who has ever built a new home will tell you that it can be an emotional roller coaster ride. But guess what, it is worth it. That’s why we do it. As a consumer purchasing a Factory Built Home, you need to make sure you connect with a team of professionals that are going to guide you through the whole process, making the crooked roads straight. GCH has a friendly and skilled staff with a variety of talents and experience to get the job done. The team at GCH is committed to making your home buying purchase as smooth as possible. Although we are not perfect, we will always Do the Right Thing for our customers, just because it is the Right Thing to Do! Excellence. It’s hidden in the details. For many Factory Built Home retailers it’s all about price. They feel the cheaper the price the more homes they will sell. They are so concerned with having a lower price than their competitors that they cut corners, install the cheapest central air units, skirting, steps, and offer few exterior amenities. They skimp on many important aspects with installing the Factory Built Home because the consumer can not visually see it, and are often unaware of the possible consequences until it’s too late. Many retailers also push financing options that are more favorable for themselves than the consumer. The consumer may end up paying less for the home, but their monthly payment is equal to or higher than if they would have purchased a more quality built home with a much better installation from GCH. GCH is committed to not only offering the best Factory Built Homes on the market, but we order our homes with the most energy efficiency rating and the proper upgrades today’s consumer expects, so you can enjoy your home for many years to come. We also insure that they are properly installed by the best contractors in the business to safeguard the life of the home and secure your investment. How long does the home buying process take for a Factory Built home? There are many variables and moving parts when it comes to buying a Factory Built home, such as: – Do you currently own land or looking to purchase land? Are you purchasing a mobile or modular home? Is it a custom plan? What type of financing are you using? Taking all that into consideration, on average it takes approximately two to five months from application to move in. What type of credit do you have to have to qualify for a factory built home loan? With most lenders there are two main factors that will effect their decision to loan money for a home purchase. The first is the ability to pay. This is governed by your income and current debt ratio. Can you afford it? The second is your willingness to pay. Will you pay them back? This is usually judged by your credit history. GCH utilizes several different lenders for both mobile and modular home financing, and for both good credit and credit challenged customers. VA and FHA government insured loans usually look for a 620 or better FICO score. One lender GCH has teamed up with will go as low as the low 500’s with a larger down payment and or land equity. On your website you sell two brands of homes. What is the difference between a Jacobsen Home and a Scotbilt Home? Jacobsen Homes is the number one builder of Factory Built homes in the state of Florida. They have a reputation for high quality construction, luxury options, customization, and offer the best warranty in the business. They build both mobile and modular homes. One, two, and three section floor plans are available. Many Jacobsen Home buyers are exchanging their current mobile home for a newer one and this time they want to do it right. They want to have it built exactly the way they want, and some want ALL the bells & whistles that are only available in a Jacobsen Home. Scotbilt at this time only offer mobile homes and do not build modulars. One and two section floor plans are available, as well as the largest two section home floor plans in the market. They do some customization, but what they are really known for is offering a lot of “Bang for your Buck”. They build an excellent home at a very affordable price. Many of our Scotbilt customers are those who are looking for the most square foot for the dollar without sacrificing quality. GCH would like to invite you to visit our model center and let you experience the difference for yourself, and see which home is going to meet or exceed your needs and fit into your budget. What is the difference between a Mobile Home and a Modular Home? Many of our GCH customers ask this question and are often confused about the similarity and the difference between Mobile Homes and Modular Homes. First, both types of homes are built in a factory and are therefore considered Factory Built Homes. Mobile Homes, often called Manufactured Homes, are built to comply with the National Manufactured Home Construction and Safety Standards (Hud Code), whereas a Modular Home is built in accordance Florida State Building Codes (DCA Code). The same code that governs a traditional “Site Built Home”. GCH offers both types of homes and our professional sales staff can help you decide which option is best for you and your individual situation. What is the difference between an "On Frame" Modular Home and an "Off Frame" Modular Home? This is another popular question many of our GCH customers have, and are often confused about the difference and similarity of both. The key word here is FRAME. Asthetically the homes will look almost identical. As far construction goes the only real difference is that the “On Frame” Modular Home has 2×8 floor joist 16″ on center where as the “Off Frame” has 2×10 floor joist 16″ on center to compensate for not having the Frame underneath it, and a greater span between the foundation walls. Both Modular Home types are built like tanks and are able to withstand wind speeds of up to 180 miles per hour. If you ask which is the best you may get conflicting answers from different people. They both have advantages and disadvantages depending on your individual property situation, zoning, and sometimes financing. GCH would like to invite you to our model center and discuss with our professional sales staff which Modular Home option is best for you. When an “On Frame” Modular Home arrives to your property the Solid Steel I-Beam Frame stays with the home and is set on our specially engineered block & pier foundation. The Solid Steal I-Beam Frame is actually part of the foundation for the home. The home is then set and anchored into the ground similar to a mobile home set up only much stronger. Gainey Custom Homes closes the open space under the home with stucco underpinning instead of vinyl siding like a typical mobile home. The stucco underpinning can be designed to look like concrete block, brick, or stone with several color options available. When an “Off Frame” Modular Home arrives to your property the home is unbolted from the FRAME, picked up with a Crane and placed on a Concrete Stem Wall Foundation, very similar to an off grade site built home. The home is then anchored and strapped into the foundation. Do you accept mobile home trade ins? Absolutely! Although it can be difficult sometimes to judge exactly what your current mobile home is worth, GCH is committed to help you get the most value for your current mobile home. We sometimes bring them back to our retail sales center, remodel, and resale, or we have investors that may buy your home directly from you and take it to one of their lots. If your current mobile home has no resale value do to its age or condition we can have that mobile home removed from your property and place a brand new mobile or modular home where that one was located. Many of our customers are able to use their trade in lieu of a cash down payment regardless of its condition. What type of exterior amenities do you offer? GCH is committed to offering our customers absolutely everything they desire in their new home purchase. Our limitations are only your imagination and your personal budget. Sometimes the appraised value of the whole package may limit the amount of amenities we can add depending on your loan type or land equity. With that in mind GCH can help you with: Large decks, covered porches, gutters & down spouts, asphalt or paved driveways, landscaping, storage sheds, and garages. We can also upgrade your septic / drainfield, well or well pump, and install new underground electric utilities. What if I do not own land? How does the process of buying a new home and land package work? The first step is to visit our retail sales center and find a home that will meet your needs and fit into your budget. Once that is accomplished GCH will help you arrange your financing for a construction loan. When you receive your preapproval GCH will assist you in finding land if you have not already done so. When you find the perfect lot we will help you obtain a contract on the property and begin the home/land loan and construction process. This will include a site evaluation, title search, appraisal, and survey of the land. At the same time your lender will be processing and underwriting your loan. Once all this is completed you will close on the loan, the land will be deeded into your name and we will begin construction. Once the home is delivered and all utilities are tied in there will be some inspections done by the county and the lender. As soon as they are clear you will have a modification of your loan. Just a few more papers to sign. Then you will receive your keys and begin living happily ever after in your new home. You usually will not have your first payment due until 30 or 45 days from the this day. 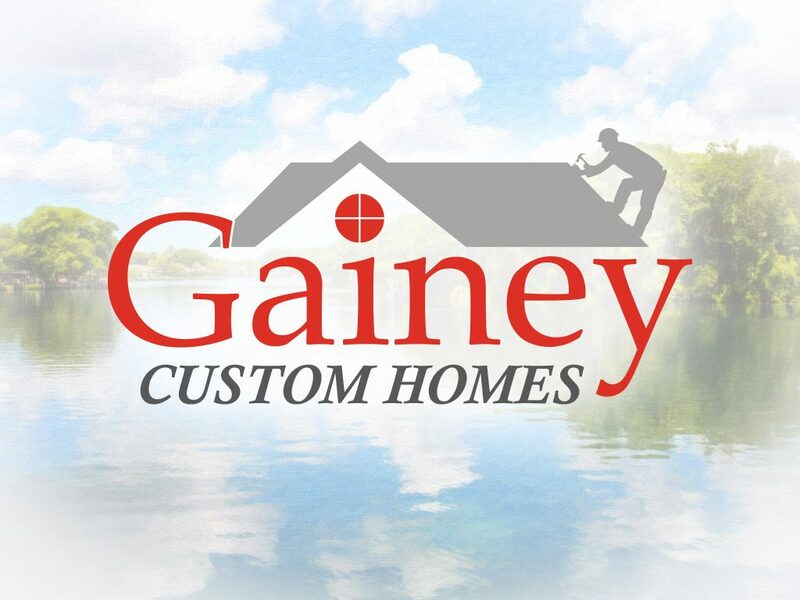 Contact Gainey Custom Homes for a free home consultation and pre-qualification. There is no obligation or pressure! Purchasing my new home with Gainey Custom Homes was a delight! Always had all the information of what was happening as my new home was being delivered and setup on our property! Thank you so much for being so great!